A pilot program began this week in Toms River that state officials hope will prove successful in keeping sea nettles, stinging jellyfish that invade Barnegat Bay each summer, from overwintering and multiplying. The state Department of Environmental Protection kicked off its Barnegat Bay Bulkhead Blitz on Monday, aimed at educating waterfront homeowners on how they can help stem the tide of sea nettle proliferation in the waterway. In recent years, biologists and university studies have produced evidence that the switch from treated lumber to vinyl bulkheading material has allowed sea nettle larvae to attach themselves and overwinter, leading to an increase in population over time. The “Blitz” event focuses on ways homeowners can remove the larvae from their docks and bulkheads. The state’s pilot program, initially being held in the Silverton section of Toms River, imparts the message that keeping sea nettles in check is as simple as periodically scrubbing or power-washing the speck-sized polyps that adhere themselves to hard surfaces. The polyps, if left attached over the winter, eventually spawn into buds, which are released into the water in the spring and grow to become sea nettles in the summer. The first-ever “Bulkhead Blitz” was conceived after the DEP reviewed the results of a three-year agency-funded research study about the presence of sea nettles in Barnegat Bay as part of the Christie administration’s eight-point plan to tackle the bay’s health issues. 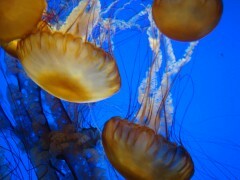 The $283,000 study, conducted by Dr. Paul Bologna, Director of Marine Biology and Coastal Sciences at Montclair State University, determined that a higher density of sea nettles in the northern areas of the bay could expand southward, as well as into other New Jersey estuaries and coastal waters, potentially posing threats to other marine life. Currently, jellyfish are especially prevalent in Brick, Lavallette and Toms River. Scrubbing the nettles off hard surfaces at this time of year prevents their full development for the next summer season and help curtail their spread to other parts of the bay, researchers have concluded. Property owners in lagoon communities are being encouraged to remove floating docks during the winter or clean them using a non-wire scrub brush or by powerwashing manmade bulkheads and docks below the low tide line to remove sea nettles. Detergents or other cleansers are not necessary during the scrubbing process. While Monday’s blitz occurred in Toms River, the DEP plans to eventually expand educational efforts to other areas of Barnegat Bay with high concentrations of polyps. More information about the sea nettles research project, Dr. Bologna’s findings and other work being done to study Barnegat Bay will be presented at a 2015 Barnegat Bay Research Forum on November 17. The forum, sponsored by the DEP and the Barnegat Bay Partnership, is scheduled from 9 a.m. to 3:30 p.m. at Ocean County College, 1 College Drive, in Toms River.